This traditional white IP54 flush fitting outdoor porch lantern with white sanded glass is perfect for lighting your porch and outdoor areas at night. The traditional fitting has a classic white cast aluminium frame and sanded glass panels, which creates a soft yet practical lighting effect. This fitting is rated IP54 and fully splashproof to protect against the elements. This white finish cast aluminium outdoor porch lantern is one of our most popular porch lights. Fitting flush to the porch ceiling it gives a downward light where it is needed and looks so stylish with the white alchromated hexagonal frame. The glass is sand blasted opal and will create a soft welcoming light. 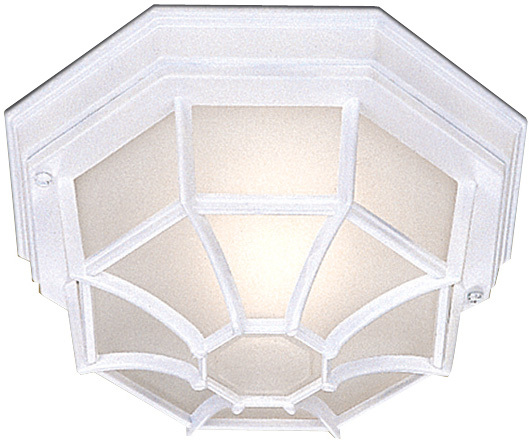 This classic flush fitting porch light comes with a 3 year finish guarantee.